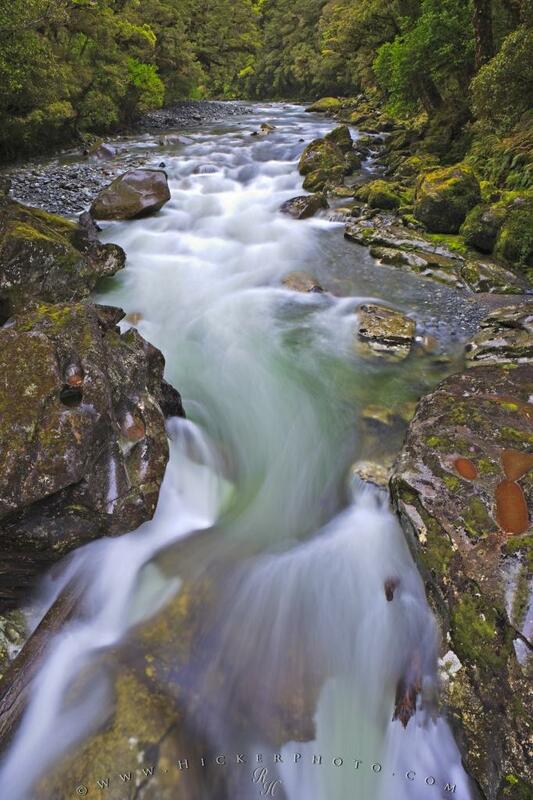 Fast flowing water in Cleddau River on a rainy day in the rainforest of Fiordland National Park in New Zealand. I photographed this long exposure flowing water picture of Cleddau River in Fiordland National Park in New Zealand on a very rainy day, which is absolute best photography weather for this location. Why? because it really shows the area as it is - I have been here now a few times and I always had the same weather: gray, cold and wet, very wet if I may add. The thing is that it "never rains" in Fiordland National Park on the southwest side of the South Island of New Zealand. No, it never rains BUT IT ALWAYS COMES DOWN IN BUCKETS. The amount of water and rain I have seen in this National Park are unbelievable. Water is coming down everywhere and the rainforest is lush and saturated green, the rivers are fast and full with fresh water and the air is as clean as it get. Pictures from photo gallery "Water Pictures"
This picture is part of the photo album "Water Pictures" - there are more beautiful images waiting for you. This photo will be my contribution tomorrow to #FlowingWaterFriday on Google Plus, which I curate myself. I photographed this flowing water photo with my Canon 1Ds Mark2, 24mm, f13, exposure time 2.5 seconds on ISO 50. Flowing water in the rainforest on a rainy day of Cleddau River, Fiordland National Park, Fiordland, South Island, New Zealand. I photographed this photo with the digital SLR camera model Canon EOS-1Ds Mark II, aperture of f/13.0, exposure time of 25/10 sec. on ISO 50, as always I used a original Canon Lens, the focus lenght for this picture was 24mm.